Q: Are there any baby friendly hotels with heated pools in Granada? A: There are some great hotels with pools in Granada to choose from. Here are some suggestions for you. The 4 Star Hotel Gran Luna de Granada has an indoor pool as well as an outdoor heated pool. Its location close to the Granada ring road A-44 makes it a good option if you are planning to hire a car and drive from the airport. The only downside to this is that it would be quite a walk into the city centre. If you are looking for something closer to the centre, have a look at Carmen Hotel. This four star hotel is in a great location and has an outdoor seasonal pool. Four Star Villa Oniria is a beautifully restored 19th century manor house, has an indoor pool and is also in easy walking distance of city centre. 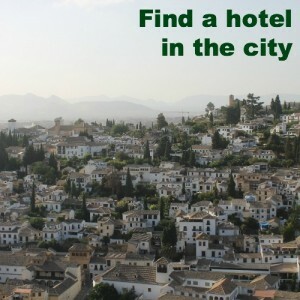 Another hotel that is easy to access by car is Hotel Alixares which is right by the Alhambra. This offers an outdoor seasonal pool. There is easy access by buses and taxis down the hill to the city centre. Siutated 4.5 km outside the city is Hotel Darabenaz. Set in a restored Moorish palace dating back to the 13th Century this 3 Star hotel offers an outdoor swimming pool in lush surroundings. I hope that you found this helpful. If none of these are what you are looking for click here to search for more Granada hotels. If you have a question about where to go and what to do in Granada, ask us here and we will try to help.